Ocala, Florida — Ocala Post first ran a story on Polliwog Dental on August 30, 2013, after the owner, Michael Tarver, lashed out directly toward Medicaid patients. Polliwog Dental was investigated by the DEA back in July for suspicion of overmedicating children. Specifically using Demerol to sedate and “control” children whom Mr. Tarver felt were misbehaved, according to his own words. 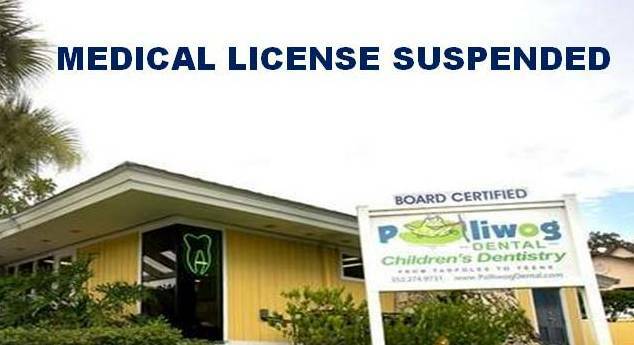 Today, at Approximately 1:46 p.m., Michael Tarver’s (Polliwog Owner) license to practice dentistry was entered into an emergency suspension. EMERGENCY SUSPENSION – the licensed practitioner Michael Tarver is suspended by emergency order of the department. Licensee may not practice in Florida while license is suspended under emergency order. The practitioner is obligated to update his/her profile data. We contacted the American Academy of Pediatrics and asked them about small children being dosed with Demerol in conjunction with Novocain and Laughing gas. The American Academy of Pediatrics advises dentists that they should find an alternative medicine when treating young children. Demerol should not be used as a sedation drug. Demerol is a narcotic and it does have different effects on each individual person, especially children. The AAP warns that Demerol should only be used for painful invasive procedures and not for the practice of sedating. AAP also warns that Demerol could have serious negative effects on children. According to the AAP research, Demerol has many of the side effect characteristics that you would not want to see in children. In addition to the side effects, the correct dosing for Demerol in small children is not really known, often leading to a dose that is too high and sometimes causing the child to be sedated for up to 19 hours. Although Demerol is 10 percent less the potency of Morphine, proper precautions must be taken when prescribing Demerol to small children; such as vital signs constantly being monitored, especially breathing and heart rate. Narcotics are known to suppress breathing and children are much less tolerant than adults. Tarver is also accused of administering Versed. Versed is not a narcotic, but a sedating drug, a drug that is reported to have side effects more serious than that of Demerol. Experts say it should not be used in conjunction with other medications, such as a narcotic, as Tarver had reportedly been administering. Furthermore, Versed can cause serious breathing problems, and officials say it should only be administered in a hospital environment under constant cardiac and respiratory monitoring. Something many dentist offices are not equipped to do. Tarver denies the allegations and originally denied being investigated by the DEA. After Tarver tried to defend his practice by lashing out at parents on Ocala’s Word Of Mouth Facebook page, the allegations slowly surfaced, exposing the ill practices of Tarver’s Dentistry known as Polliwog Dental. Ocala Post has included details of the emergency order. However, we should warn you, it may be disturbing to some.